As Thunder 2019 came and went, volunteers spent their Sunday picking up mounds of trash left behind by attendees. 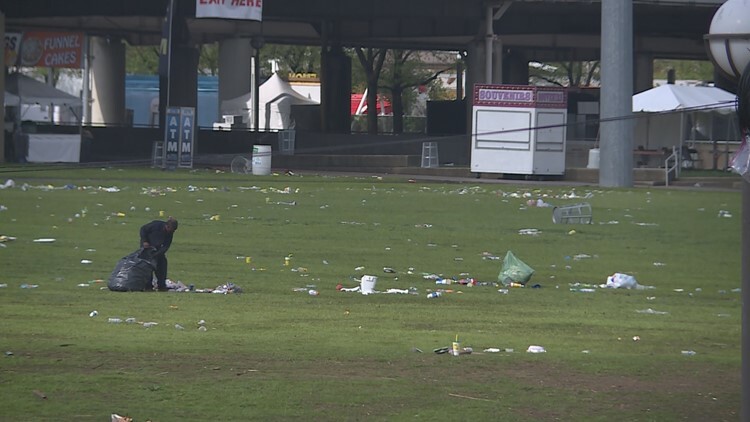 LOUISVILLE, Ky. (WHAS11) – As “Thunder” boomed through Louisville to mark the start of the Kentucky Derby Festival, cleanup began soon after as piles of trash were left behind. Various items were left on the Great Lawn including food, cans, bottles and plates and even chairs and blankets. The Jeffersonville High School track team crossed the river to help restore the Great Lawn to its beauty. Some say the fun was worth it but many need to be aware of the trash left behind. “It’s worth the fun but the fact that people don’t care about not picking up their trash makes it not worth it. It’s a fun event for everyone to enjoy,” Dakyla Campbell said. The track team was one of many groups who participated in the cleanup on the waterfront. Operation Brightside also had crews on hand.